Welcome, welcome all to the new site design! This was supposed to be the biggest gift we had in the works, but due to some technical difficulties, we were unable to release it on time. That's okay, because I'd rather have a working site as opposed to rushing it out and having it be broken. What you see is the fifth site design we have used. And man, do I like it a lot! Check out the various pages in detail to see all the neat little changes we did. We kept some functionality from the last version of the site, and have worked towards making everything cleaner and more efficient! A couple of new things to be aware of: Every post made by the staff will have the respective mug. Soulred12 did this in his last post, and I'm doing it in mine. This should make things a bit more personal and stand out a bit more. Second, there will be another small gift coming! What will it be? I don't exactly want to ruin the surprise for all of you, so I'll keep my big mouth shut! I know there's been of an update drought as of late, but believe me, we're still working hard to deliver this fantastic game! We'll keep on truckin' if you'll keep on supportin'. Long live Chrono X! Chrono X is 4 years old! Today, May 10th, marks the Chrono X project's glorious fourth anniversary. Yes, four years ago today, our project began as a fledgling, and now, four years later, it has made more progress than we could have hoped for. For those with us since the very first public PC demo (it's no longer available for download), it's quite a thing to behold when comparing it to demo 4.0.1. And, of course, what would an anniversary be without celebration? Therefore, we are declaring the next seven days "Chrono X Anniversary week," during which we'll be releasing various goodies. We're starting with...the high quality Demo 4 OST, available now for download for the first time! Get it here! But that's not all! There are a few goodies in that zip, in the form of bonus tracks! 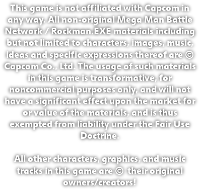 And not just DarkMegaman's theme--there's also two additional bonuses. First, an unreleased track. What do you think it was meant to be used for? Second, there is an old, unused version of a popular track, back from when Chrono X was young and still trying to discover its true identity. We think it's still a good track, even though it didn't end up being used, so we included it just for you. As we take a look back at these four years, many things have changed: the team roster, the graphics, the story, the ideas, but the goal is still the same! We're here to develop a full-fledged Battle Network game! Keep an eye out in the next few days for more updates--and more goodies! Let's be honest. Who REALLY fell for it? Well, a few people actually. I'll come clean and say I had a few good laughs over the people that did actually believe the joke. Especially when I tried to make it as painfully obvious as possible. Anyways, enough of that. We're going to give you guys more of the actual game in an update coming soon. Now, if you followed our Facebook for the new screenshot we posted, then we hope you enjoyed it.